The Langham's Aria Bar & Lounge, invites your family to enjoy a special Sesame Street High Tea this summer. Melbourne's luxurious hotel and iconic eatery positioned on the riverside of the city's Southbank precinct, organises themed children's high teas every season. Previous high tea events have seen themes such as the Minions, Smurf, Barbie, Frozen, Paddington and Mr Men & Little Miss High Teas. This summer's high tea takes a stroll down memory lane, inviting you and your kids to enjoy a Sesame Street feast. Ernie’s rubber ducky shaped vegetable pizza. All of the above will be accompanied by the hotel’s famous mini scones served with jam and cream. Children must be accompanied by an adult. Book in for your child's high tea and treat yourself to a Wedgwood or Chocolate Indulgence High Tea. Adult high teas including a glass of premium sparkling wine, espresso coffee or loose leaf tea. 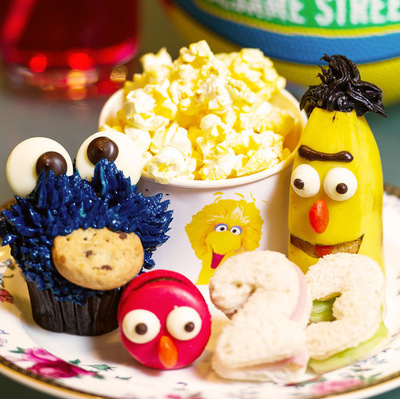 Sesame Street Children's High Tea at The Langham sessions will run from 28 December 2015 to 28 January 2016. There are two sessions to choose from, 10 - 11:30am and 12 - 1:30pm, Monday to Friday.